Luke Fitzgerald has hit out at the criticism of Joe Schmidt after Ireland's defeat to Wales - and says there are four areas where the team can improve to rediscover top form. Schmidt's side finished the 2019 Six Nations as they started it - with a comprehensive defeat to a rival. England handed Ireland a chastening opening day loss at the Aviva Stadium but the performance against Wales in Cardiff last Saturday was even more worrying, with a number of key men failing to fire. The Irish players now return to the provinces ahead of the European quarter-finals at the end of the month, and Fitzgerald says that a break from national camp has come at the right time and that criticism of the national team has been over the top. Speaking on The Left Wing, Independent.ie's rugby podcast in association with Aldi, Fitzgerald disagreed with the reaction to Saturday's loss, and in particular the flak directed at Joe Schmidt. "I think players, coaches and supporters need to catch themselves," Fitzgerald said. "This is the most successful period we've had in a long time and we've had two bad performances - things aren't that bad. We still have the best coach in the world. Some of the garbage I'm reading and listening to about the coach - I just can't believe it. "This team has not gotten bad overnight. The players have not gotten bad overnight. A few things have worked against them that have accentuated a lack of form, like game time for key guys, guys getting injured at the wrong time and guys coming in cold having not played much rugby. "So there are a few things that haven't gone right from them and from a supporters' perspective, we need to calm down. 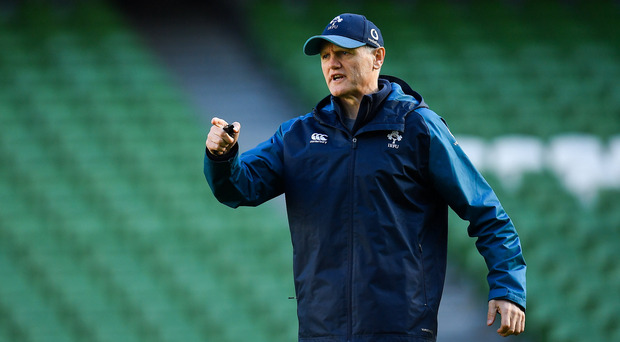 Joe Schmidt has been remarkable everywhere he has gone, and he is still remarkable. They will figure this thing out and just need a bit of time to step away." Looking ahead to the World Cup, Fitzgerald added that he thinks Ireland don't need to drastically change things in order to be competitive. Schmidt's team have four warm-up games before travelling to Japan, and Fitzgerald said that there are four areas - the kicking game, the ability to generate go-forward ball off the half-backs, the breakdown and defence - that need to be tweaked in order for them to rediscover top form. "As much as we are all doubting Joe now, I think that is wrong - the guy is brilliant," Fitzgerald said. "He will go away and have a deep think about it. He will try and figure out why the kicking game didn't go well for them, and whether they need to make some adjustments with that. Sometimes you can go across the field with a few high balls rather than always using Conor Murray. Just to keep defences guessing like England, who really stifle the chasers. "That's one thing they might consider. I also think he will have a good look at why Ireland weren't able to get momentum from the forward runners off nine and ten. I didn't think they used the stuff off ten as much. I think they might get more creative. "I also think he will go back to the heart of the game, which is what he calls the rucking. I think he will try to figure out if there is something Ireland can do there. I think sometimes they are over-hedging and worried about resourcing the ruck a bit too early. I think the outside cleaner is too tight at the ruck and I think that is a problem for them. If you are too tight because you are thinking about being in the ruck rather than taking a pass, the defence can follow you in and two guys can tackle your guy and it doesn't open up passing channels. "Defensively as well, I thought they were passive. They got off the line, but they kind of stopped there. A key guy for that, and you'll see it for Leinster as well, is Robbie Henshaw. "A big part of Andy Farrell's defensive system is that everyone keeps coming forward. What it means is that while it can be a harder tackle to make, because you can lose your footwork, the attacking player's decisions have to be made way earlier. You should make more offensive hits and send them back more. That's something that they can change. "They are four things that I know Ireland can do really well and they need to go back to doing those things really well."